Is there such a thing as a happy Monday? Probably not, but this might help. We have revisited and re-imagined some of your favorite coldLogic items as a special Monday treat. Not only is this an extensive line (11 items!) but they are launching during out Pre-Labor Day Sale AT SALE PRICE*. You read that correctly, new items launching at 50% off, how often does that happen? But act fast, our sale only lasts until this Wednesday (29th August) so head on down to our main store location and start this week right! Also, here is another reminder that FATEwear will be opening sometime next month on the newly opened region FATEisland which is connected to the north side of Zyrra. Subscribe to the FATEdesign subscribo and receive a free mesh menswear outfit. Read more about FATEisland on Damien Fate’s blog. Happy Wednesday fashion fans and sale seekers, do we have a treat for you! 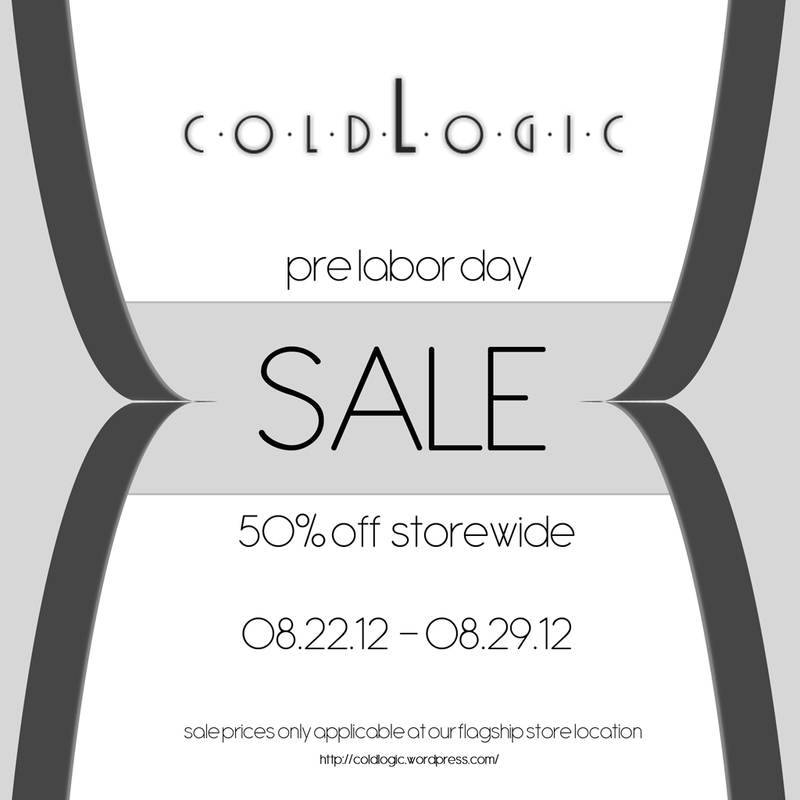 Starting today, coldLogic will be hosting a 50% pre labor day sale on all items, store-wide for one whole week (22nd August – 29th August). This sale takes place in our mainstore location only. We at coldLogic would also like to take a moment to promote a new and upcoming mesh menswear brand – FATEwear – by one of our creators, Damien Fate. You can find a free mesh outfit for your men at a conveniently placed Subscribo sign near the entrance of the coldLogic mainstore entrance. FATEwear will be opening sometime next month on the newly opened region FATEisland which is connected to the north side of Zyrra. Feel free to poke around this picturesque mesh build in anticipation for the grand opening. We at coldLogic have been busy summoning the spirits of fashion past to bring you these seven lovely dresses from the 1960’s – done the coldLogic way. Get bookin’ to our Vintage Fair location after 4pm SLT today! We also hope you enjoyed coldLogic’s television debut in TLC’s What Not To Wear. If you didn’t see the episode, you can watch a clip of the show here.